Crystal Jill King and Randy Dwayne Young both of Danville, Virginia were united in marriage on May 4, 2013 at Wedding Chapel by the Sea in Myrtle Beach, South Carolina. Dr. Terrence Grainger officiated. The bride is the daughter of Donna and Robert Williams and Lloyd Daniel. She is the granddaughter of the late Larry and Betty Gunter and Robert and Lois Daniel. The groom is the son of Faye Young and Jason Frix. He is the grandson of David and Joan Young and the late Paul and Jane Lloyd. The bride is a graduate of Bartlett Yancey High School and Rockingham Community College. She is employed at Person County EMS. The groom is a graduate of George Washington High School and Rockingham Community College. He is employed at Rockingham County EMS. 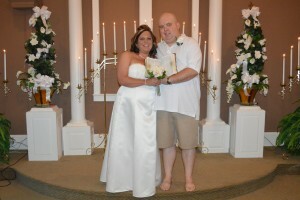 After a honeymoon in Myrtle Beach, South Carolina, the couple will reside in Danville , Virginia.